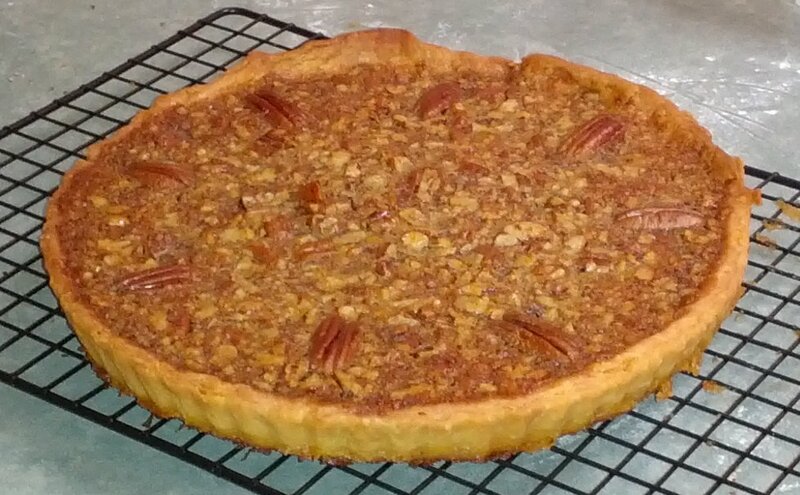 Rachel decided that she wanted a Pecan Pie for her birthday instead of a cake. Who am I to argue? I've not made one and this seemed like a great excuse. The main problem I encountered was that corn syrup is rare in Australia. I had to find a recipe that didn't include it; fortunately Stephanie stepped up to the challenge and provided a simple enough one. The use of ¾ of a cup of maple syrup gave me a bit of pause - though some recipes I'd seen used a whole cup. That's an expensive pie! Preheat oven to 200°C. Bake pastry as previously in a loose-bottom flan dish. Mix all filling ingredients except the 8 pecan halves. Pour into case and top carefully and elegantly with the 8 halves. Bake for 25 minutes, until set. Cool and serve either warm or cold with unsweetened cream. Notes: A couple of things went wrong. First up I added too much water to the pastry dough. For some reason it just wasn't balling up. This resulted in two things: when I was rolling it out parts of it were quite sticky, and when the shell was blind-baked it shrank considerably on the sides - to about 2/3 of their height. This made pouring the filling in a bit of a problem. Also the sides of the case were patched together where they weren't quite high enough. The resulting cracks let a fair amount of liquid leaking out. Bit of a mess.